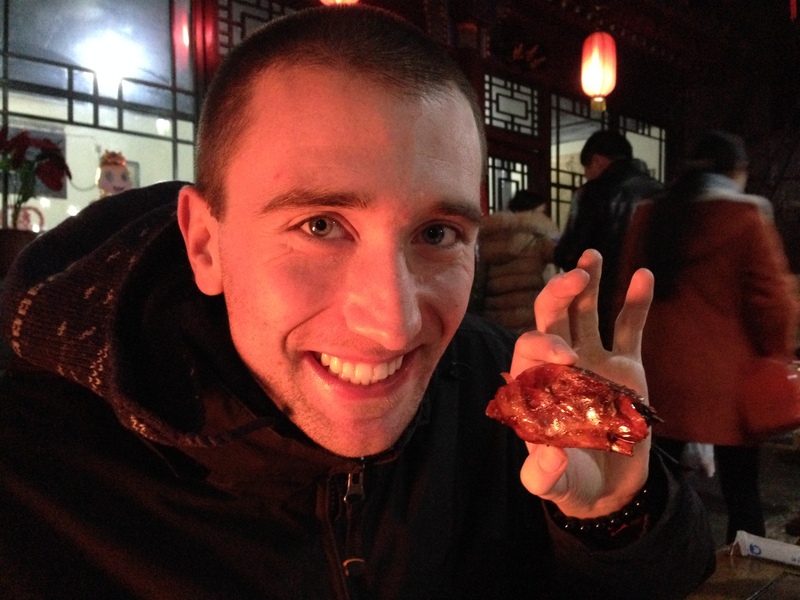 Welcome to another installation of Mastication Monologues where today I will be bringing you day two of my food adventures in Beijing! It was quite a happening day complete with a visit to the Forbidden City, and let me tell you that the only thing that is forbidden there is sitting down for a rest. It was an immense sight to see, so we worked up quite an appetite by the time we found an exit. Nearby, there was a large stretch of shopping malls and restaurants, so we decided to take a gander at what they had to offer. 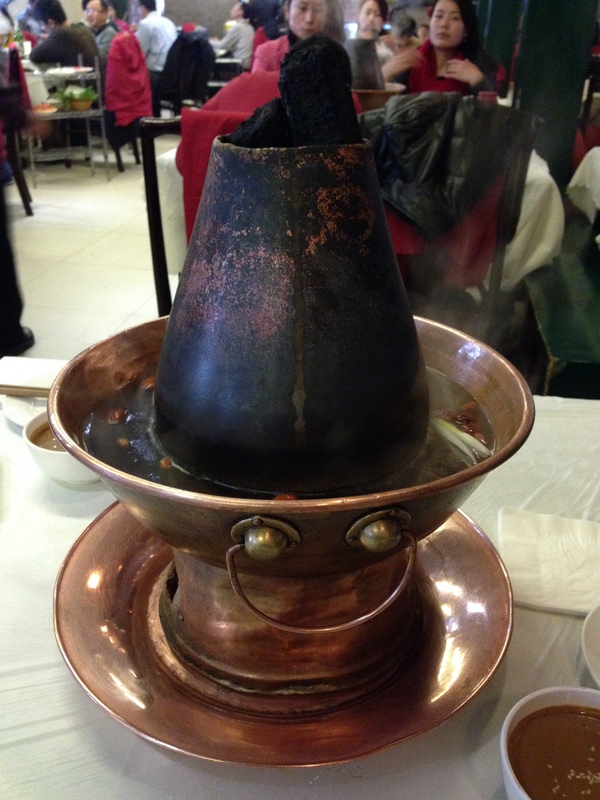 We eventually ended up at this Muslim/Uyghur restaurant. 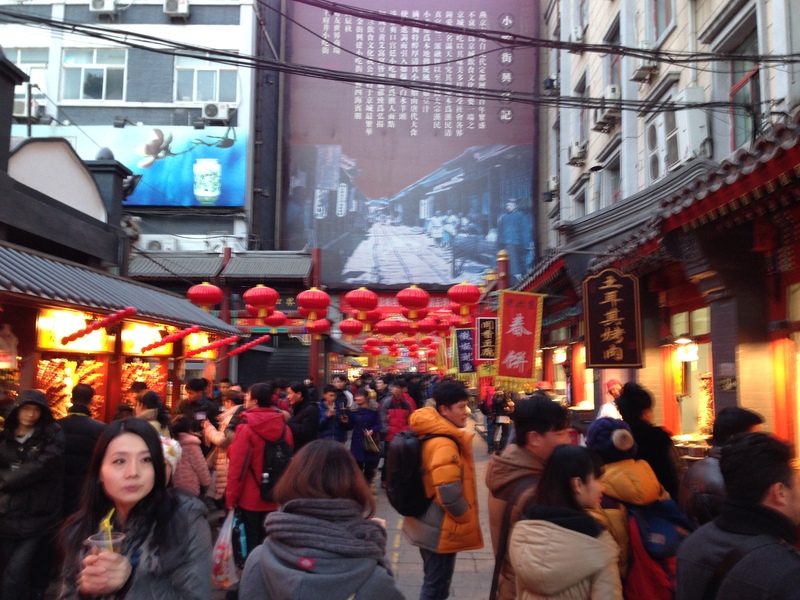 China, being the gargantuan country that it already is, encompasses a multitude of cultures and ethnic groups. The Uyghur people are one of the most distinct groups in the mix as they mainly inhabit the far western part of the country, and a majority are Muslim instead of Buddist or Taoist. In terms of food, you can definitely tell that they are not like the Han majority as they consume a lot more mutton, flatbreads, yogurt, and kebabs. A little Middle East meets the Far East flavor for ya. We were the only non-Asian people in this eatery, so the local clientele were very surprised to see us. Upon sitting down, they insisted on covering our seat backs with protective covers and the table cover with an extra layer of plastic. This was a signal that our meal was most likely going to be like Sea-World, i.e. the first three rows are going to get wet. 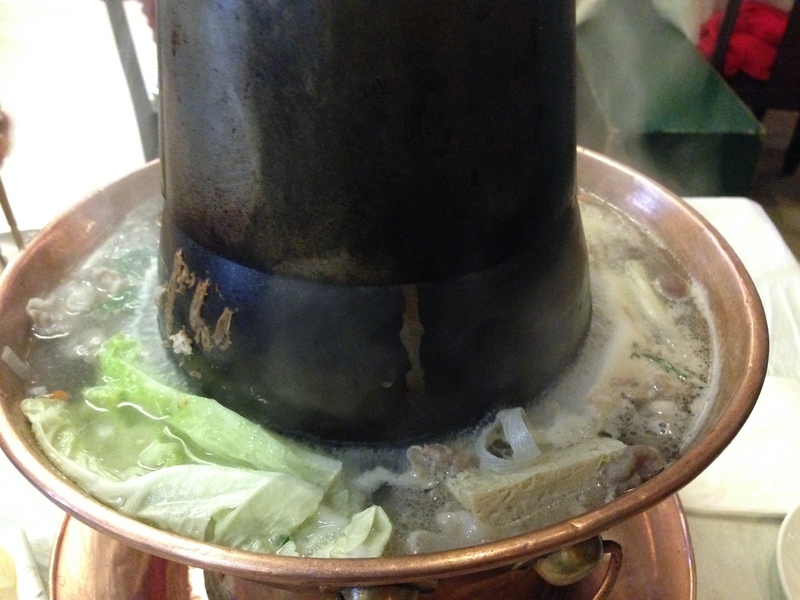 We plumped for the lunch special for two which involved a Beijing hotpot that was quite novel. I say novel in the sense that the actual cooking device didn’t look like a typical pot used for this type of cuisine. It looked more like the progeny that would arise 9 months later if a lava lamp, a smokestack, a fire pit, and a castle moat got together during one crazy weekend in Jamaica. Inanimate object freakiness aside, the rolls of thinly sliced lamb had my mouth watering. 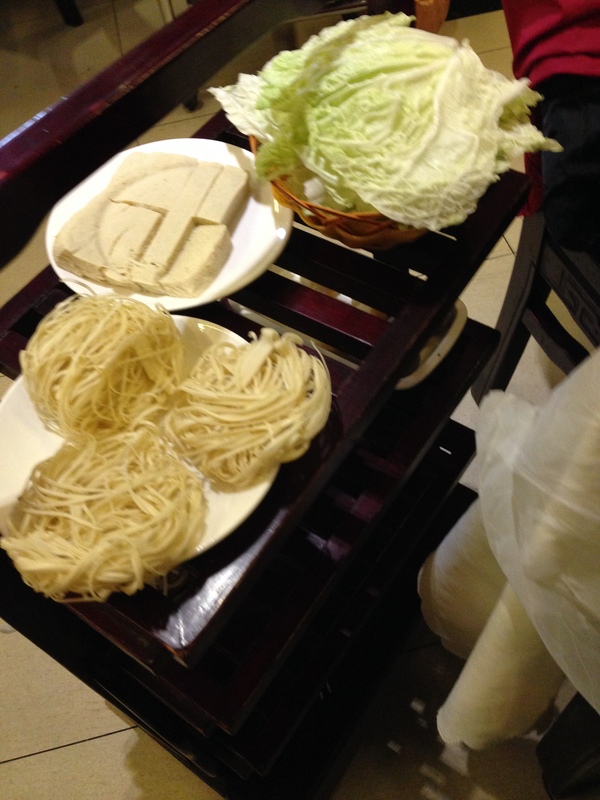 They also had scarlet bales of beef with plenty of vermicelli and wheat noodles on the side. While the meat was delectable, I think that it was a bit of a disappointment with how much of it was boiled off in the water. The shrimp were quite useless since they were frozen together in a clump to the plate the entire time…talk about fresh. If you’re a veggie head, there was plenty of tofu, fungi, lettuce, cilantro, and onions to satisfy your cravings. One of the more interesting dishes of ingredients we could throw into the boiling water were these cheese-filled, sea scallop balls and the mystery black balls. The former were quite funky in a good way with their playful striped exteriors and piping hot cheese and seafood sauce innards. The latter were a bit more unsettling since I couldn’t really tell what sort of meat I was eating, and it seemed like each meat orb had a piece of string in it. I don’t know if that came from the preparation, but it didn’t bother me terribly. All throughout the meal, I enjoyed watching the wait staff watch us eat since we were so proficient with chopsticks. They were probably thanking the heavens they didn’t have to search for a fork. 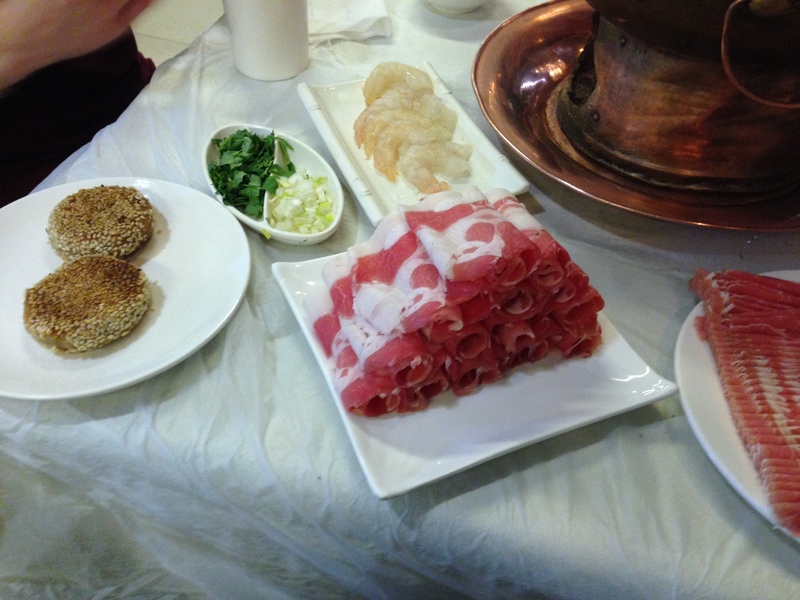 It was an ok dining experience, but I prefer my previous Sichuan or Taiwanese hot pot dinners. 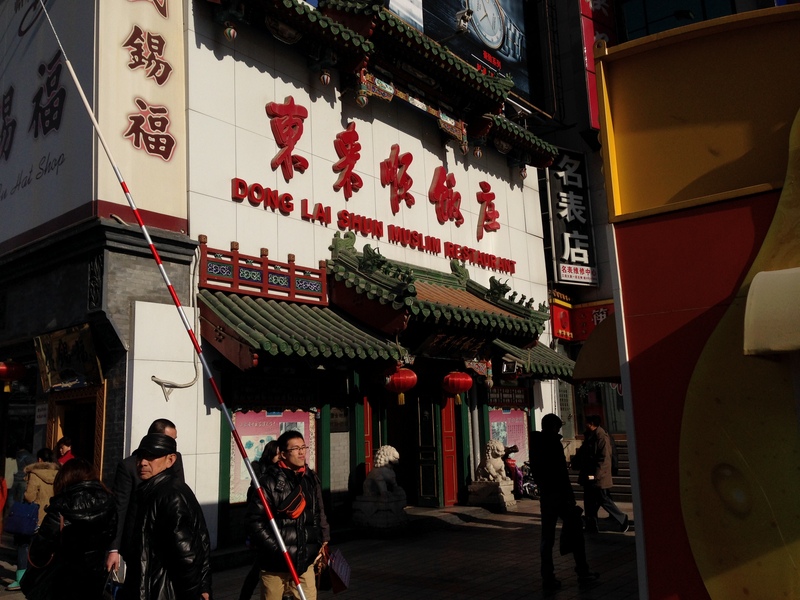 If my taste buds were snoozing on me after that lunch, I would give them a jolt they would never forget as we made our way to Wangfujing Snack Street (王府井小吃街; Wángfǔjǐngxiǎochī Jiē). 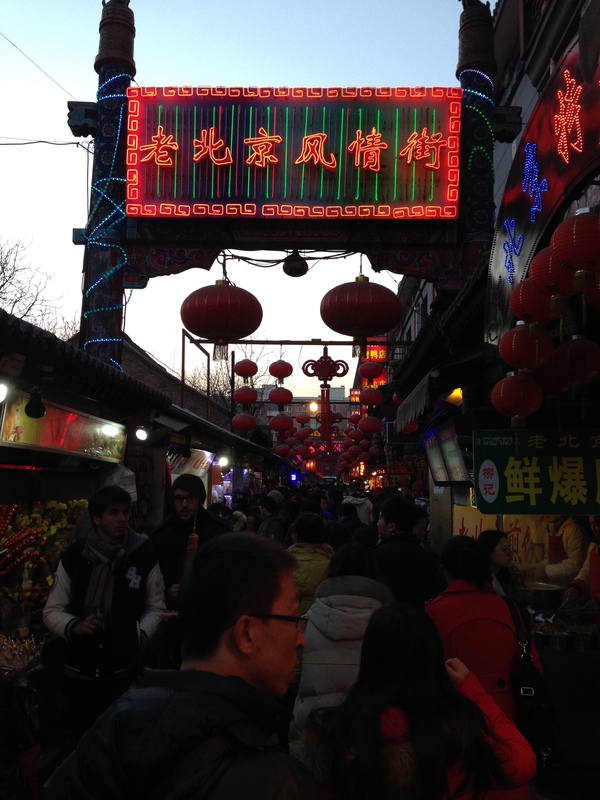 It was a lot more crowded than Donghuamen market, and it seemed more like a local place to get snack food which also meant the prices were a bit more reasonable. 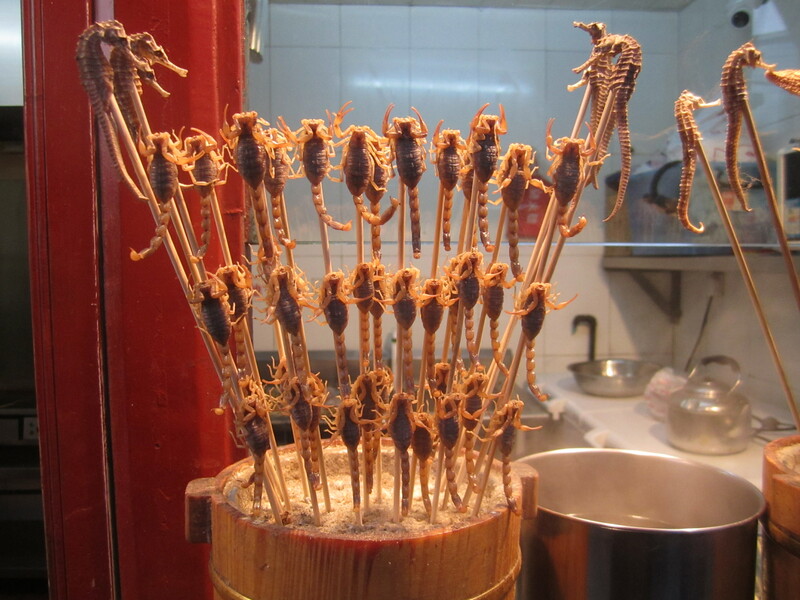 I saw a lot of the usual weird food that they also had at Donghuamen, but one of the sticks was really calling my name: the scorpions. I don’t know if it’s just the fact that they are poisonous, or that they were still alive and squirming on the stick that made me want to eat them. 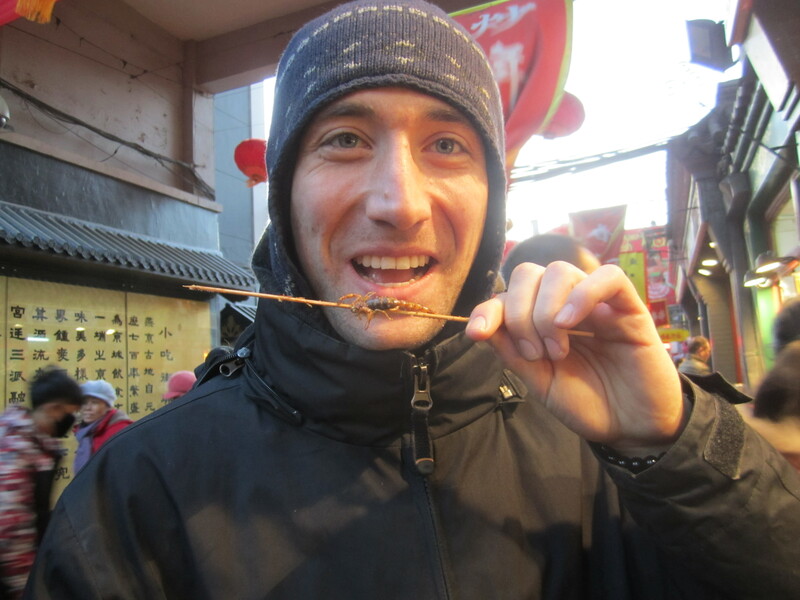 I got a stick, and it was the best bizarre food I tried in Beijing with the spider running a close second. I’d have to say that it was a mix of the chef’s spicy dry rub, and him knowing not to burn the arachnids while frying. Those two elements combined to create a snack that was crispy, piquant, with a bit of meat that didn’t taste like anything. 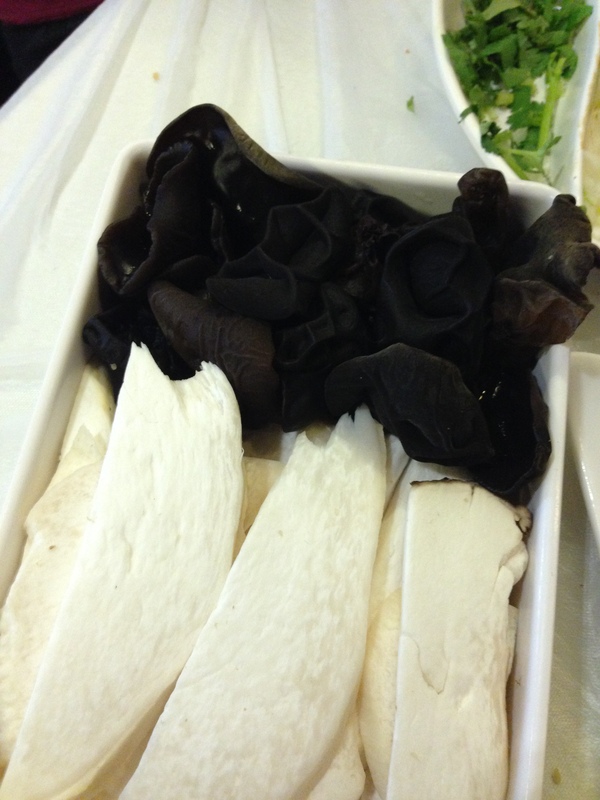 It seems that insects will taste like whatever you season them with, so I consider them the tofu of cheap proteins. Another fun part of the experience was having other western tourists walk by with their Chinese friends and reel back in horror as I took down the creepy crawlies with no trepidation. Naturally, the Chinese broke out the classic praise phrase in English, “You’re strong!” while their Western friends insisted on a raincheck when I offered them one. Quick note on Asian cuisine I’ve noticed while traveling, the weirder it seems to Western palates, more often than not it can somehow increase strength (read: male libido) in some fashion like dog soup in Korea. Long story short, I’d eat the scorpions again if I had the chance, and I recommend you try them as well. However, my day didn’t end there. 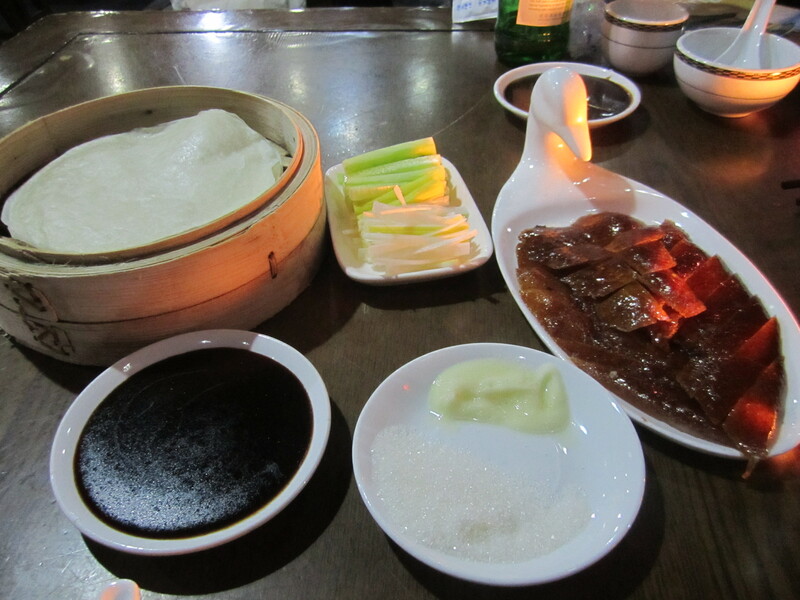 All of these brief excursions culminated at dinner where I had the signature dish of Beijing: Peking duck. 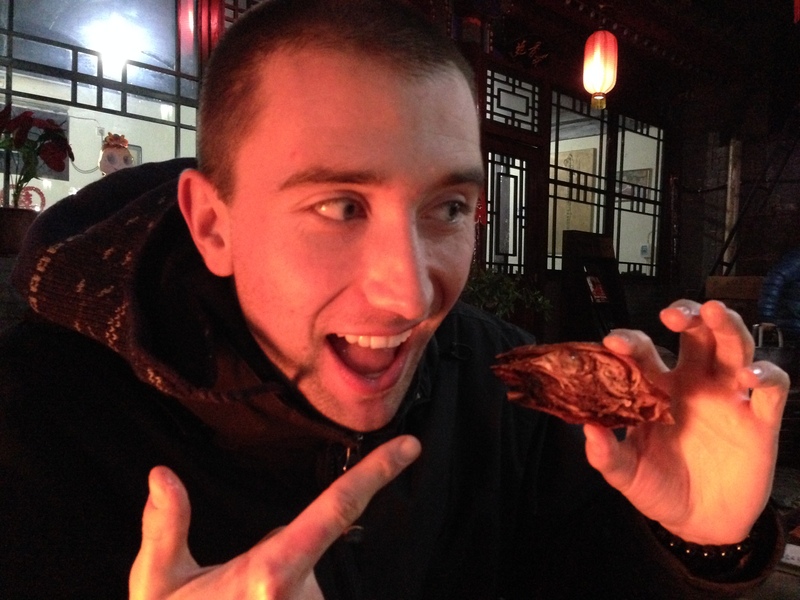 While New York has its delis and Chicago its deep dish pizza, you would have to be a fool to go to Beijing and not try one of these succulent fowls. 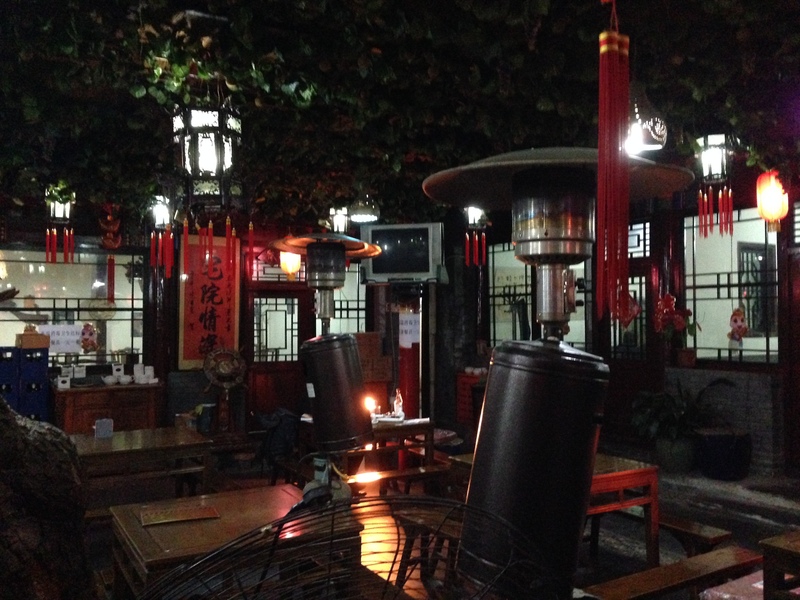 The place we went to was called Lao Zhai Yuan 老宅院. 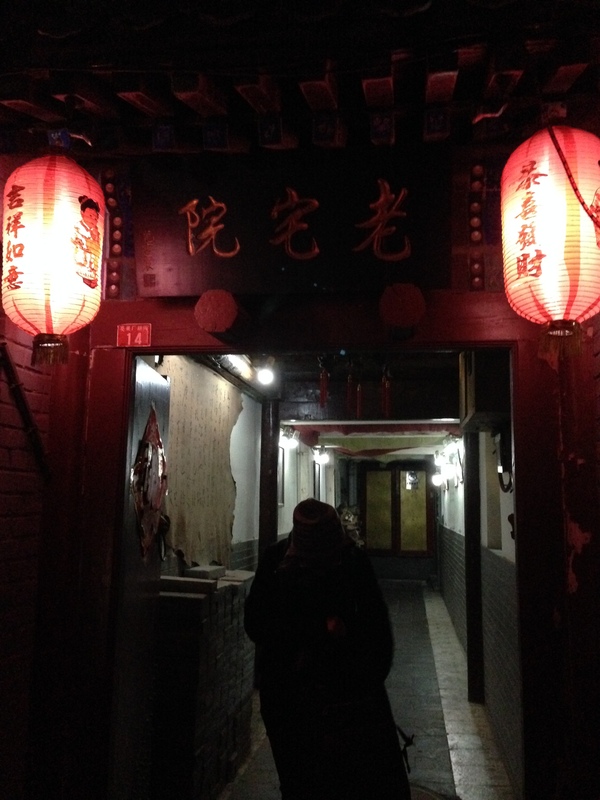 It was in a really small hutong or neighborhood and gave me the impression that I wasn’t at some touristy clip joint. We ate in one of their courtyards which thankfully had plenty of heat lamps, but it just further added to the ambiance of it all. 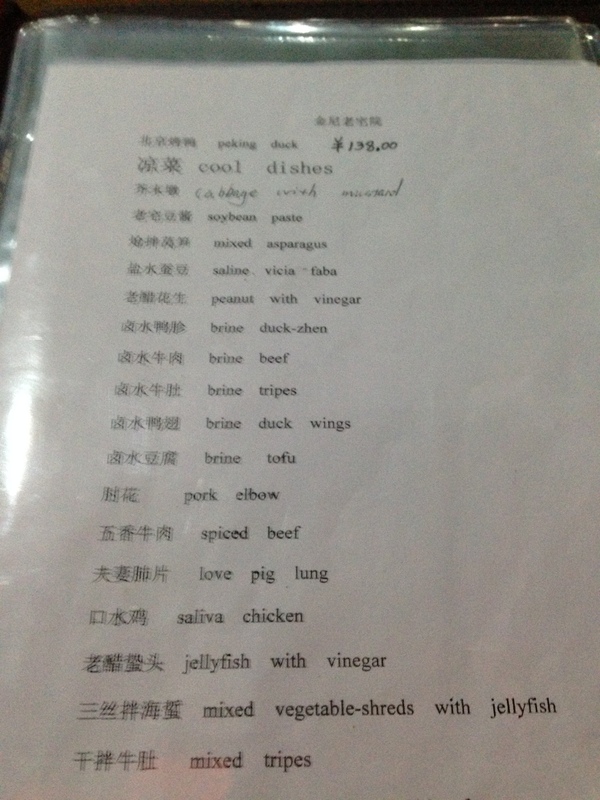 We also enjoyed the menu descriptions of some of the items they had to offer, and the prices were extremely reasonable. Our entire meal probably cost 10 bucks. 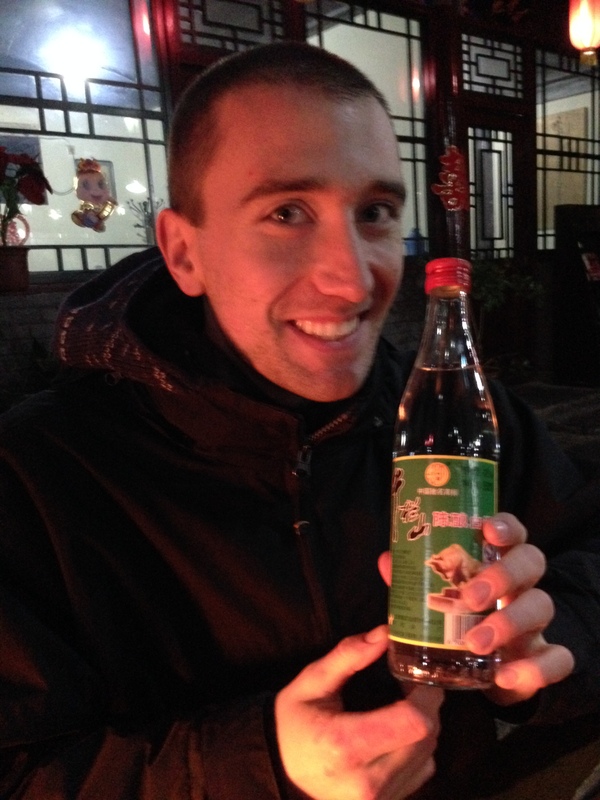 While we were waiting for our duck to be prepared, I got a bottle of baiju 白酒 which is like China’s version of Korea’s soju. However, the difference is in the alcohol content. 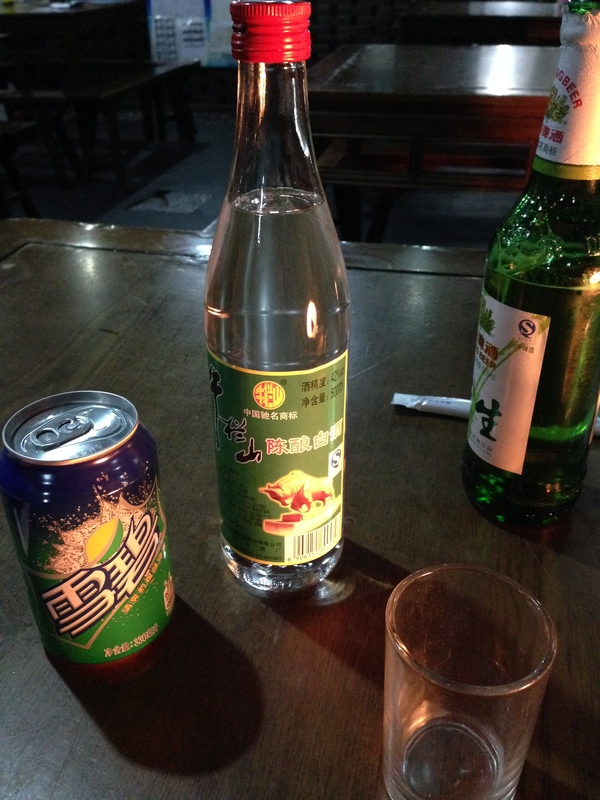 While soju only has around 20% alcohol, baiju has a 40% minimum, so it’s more like vodka in that aspect. I definitely felt that way when I took a small sip of it straight, but it got more interesting when I mixed it with Sprite. It didn’t blend very well with the Sprite like vodka would, but it added a strangely pleasing berry twist to the citrus Sprite. 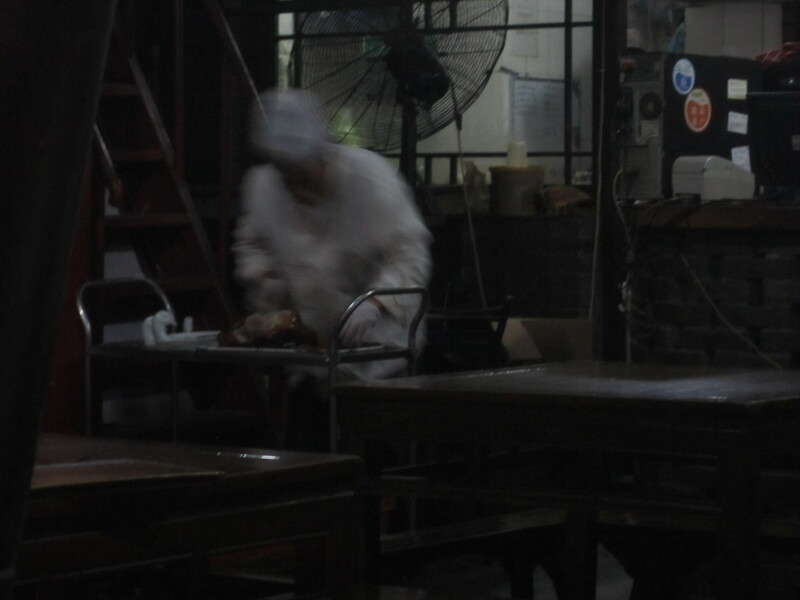 In the distance, I could smell a sweet fragrance wafting our way, and I saw our chef going to work on our duck with brain surgeon-like precision. His craftsmanship showed with each plate they brought to our table of just the meat, the golden brown skin, and the meat with strands of the skin still attached with a thin layer of fat between both tissues. 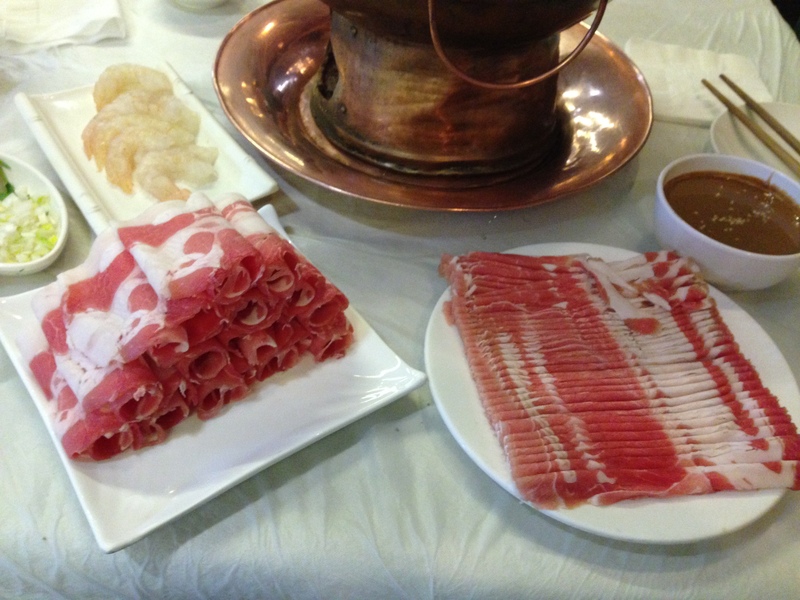 It was hands down the best meal I had in Beijing. The skin was not only crispy but had dulcet tones to every bite while the meat was tender and rich. It doesn’t take a mathamagician to put one and one together to imagine how great the skin and meat bits were. The meal was only further enhanced with the delivery method of the duck to your mouth which took the form of utilizing a paper thin pancake and smearing the plum sauce all over it first. Then, you could either put horseradish, sugar, cucumber sticks, or onions before loading up on your duck. Once you have it all piled up, you roll it taco style and enjoy. 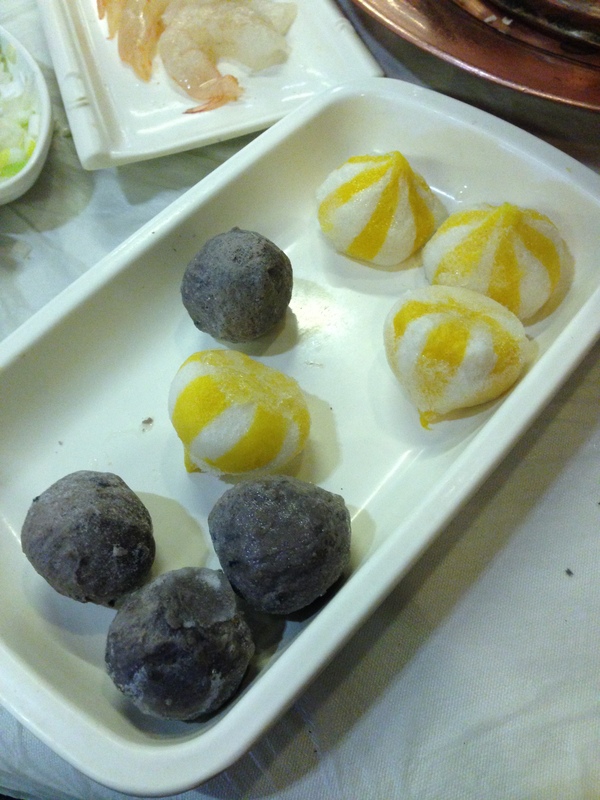 It was a great combination of sweet, savory, and tangy to create the ultimate dining experience in Beijing. The plat de résistance was the duck head that they served to us as the very last item. It was cleaved in half still with everything inside like the brains, tongue, and eyeballs. Naturally, my dining companion didn’t think I was going to eat it, but I ended up consuming it nevertheless much to her disgust. It was worth it though, and not my first time doing so since I had it in Taiwan. There wasn’t a lot of meat on it, but I’ll always say that the eyes are the best part since they have a buttery quality to them. All’s well that end’s well as I went to sleep that night with a very happy stomach. 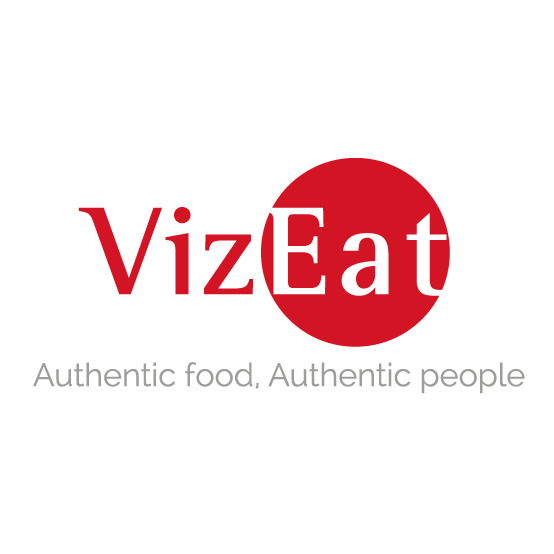 Long story short, find this restaurant, and you will not regret it.